When it’s hot and humid outside, I’m all about trying to stay cool. Besides cranking up the air conditioning, I love to indulge in a cold, delicious treat. 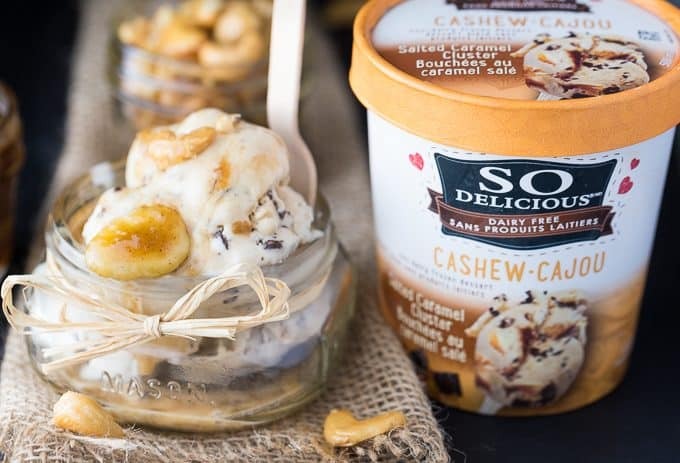 I can’t get enough of my latest find: So Delicious Cashewmilk Frozen Dessert. A big bowl really hits the spot on those muggy summer days! Our favourite flavour is Salted Caramel Cluster. We’ve purchased several cartons already and they never last long. It’s a dessert our whole family enjoys together after dinner. Did you know that So Delicious Cashewmilk Frozen Desserts are dairy free? I was shocked when I first tried it because it was so rich and creamy and not what I was expecting from a dairy free dessert! You can’t tell at all. Even John who is a bit of a dessert snob had no clue. He ended up eating the most out of all of us! They are also Non-GMO Project Verified, certified vegan, soy free and gluten free. You also won’t find any artificial flavours, colours or sweeteners. I created this indulgent dessert, Caramel Banana Nut Sundae and it was so crazy good. You have to try it! 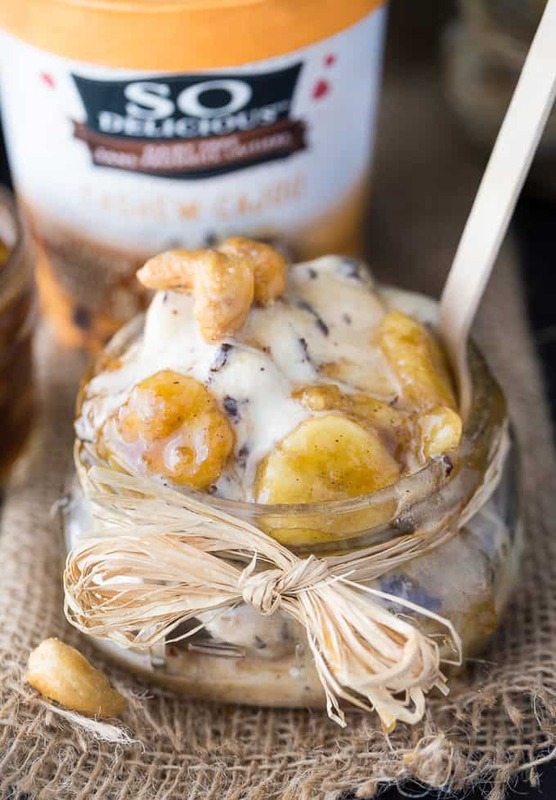 Add a few scoops of So Delicious Cashewmilk Frozen Dessert in Salted Caramel Cluster to your sundae bowls. Top with a warm banana caramel sauce that you make from scratch (it’s super easy!). You can whip up a quick batch on the stovetop in a matter of minutes with ingredients you probably already have on hand. I also garnished with some candied cashews I made with honey and brown sugar and then roasted in the oven. I figured that would complement the dessert since the star ingredient is the So Delicious Cashewmilk Frozen Dessert! You’ll fall in love with your first bite. It’s indulgent, scrumptious and a wonderful way to end a delicious meal. Find a store near you that carries So Delicious Cashewmilk Frozen Desserts and give my recipe a try! I purchased mine at our local Metro. Have you tried So Delicious Cashewmilk Frozen Desserts? Indulge in one of the most scrumptious sundae recipes ever! 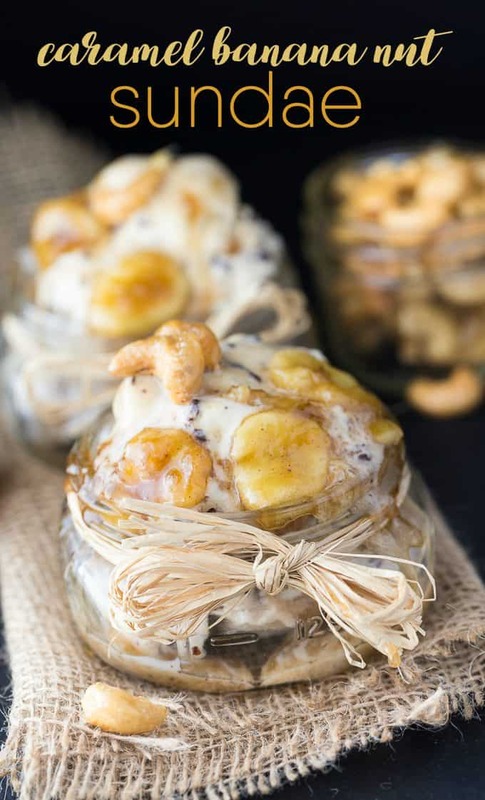 Salted Caramel Cluster frozen dessert is covered with a rich, warm banana sauce and topped with candied cashews. Preheat oven to 375F. Spread cashews on a baking sheet. Roast for 3 minutes and remove from oven. Stir honey and brown sugar in a small bowl. Carefully add cashews to the bowl and stir to coat. Spread back on the baking sheet and roast an additional 5 minutes. Remove from oven and place on a piece of parchment paper to cool completely. Melt vegan butter in a skillet over medium heat. Add in bananas and stir for about 2 minutes. Mix in brown sugar, vanilla extract, cinnamon and salt. Lower the heat to medium low and continue to stir for an additional 3 minutes. Remove from heat and set aside. Divide So Delicious Salted Caramel Cluster Cashewmilk Frozen Dessert evenly between 4 dessert dishes. 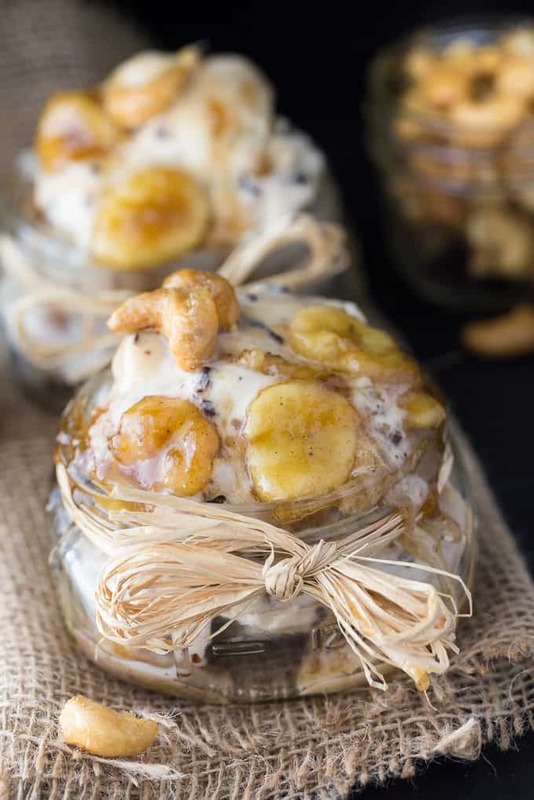 Top with Banana Sundae Sauce and sprinkle Candied Cashews on top. Serve immediately. Join the #IEatLocal Twitter Party on September 7th! 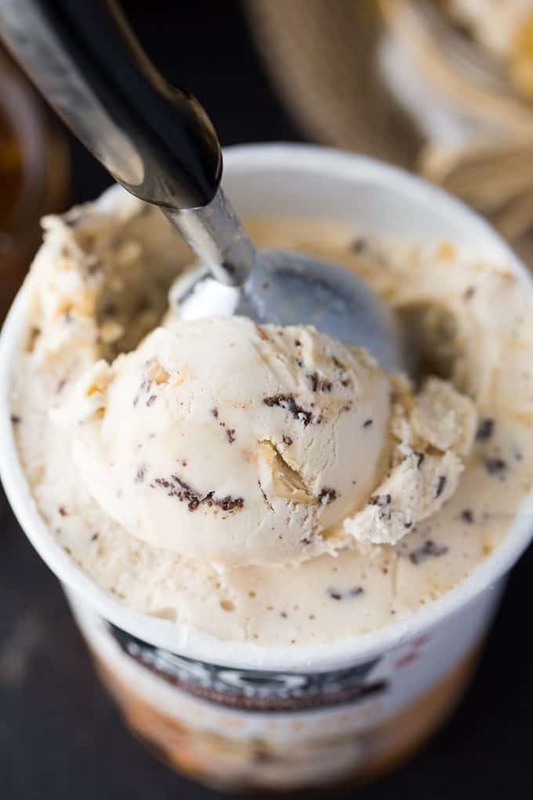 Looks good, I would just make it with regular Ice Cream but love the combination you used! Looks good but I am not a fan of bananas with ice cream. This looks amazing, better than any sundae at my local shop! I would love to make this, I am sure the combo of bananas and Ice cream is amazing. That looks divine! I would love to eat that. I’m not even a huge fan of bananas but I would love to try this anyway. This look so scrumptious! I love those caramelized toppings. That looks fantastic. OMG, talk about scrumptious!!!!! I HAD to pin this recipe – Thank you!!! Your sundae looks so delicious. The combination of bananas and caramel sounds divine. This looks amazing! My kids would love to have this as a dessert after dinner. There are so many twists on sundaes and this one is perfect. Looks scrumptious! Those caramelized bananas look amazing! My mouth is watering with just the thought of this dessert. I’m soooo excited that this is dairy free. Get in my belly! I’m going to make it for our Friday night movie and treat this week. My girls are going to love it! Thanks Stacie! I’m not the biggest banana fan, but they’re much better caramelized. I need to try this! Thanks for sharing this delicious recipe. We love all of the ingredients. I will have to look for So Delicious Cashewmilk Frozen Desserts . It looks so delicious. I can not wait to try this sundae recipe. This dessert looks so delicious. I need to pick up some So Delicious Cashewmilk Frozen Desserts so I can make this recipe. This looks amazing. I know my family is going to love it. 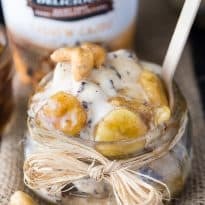 I will be picking up some So Delicious Cashewmilk Frozen Desserts tomorrow. It looks sooo good! I can’t wait to try your recipe this weekend! Bananas are my fave. This looks so amazing. Oh this looks incredible! A weekend desert…thanks. OMG Stacie! That looks so good! This will definitely hit the spot after a delicious meal! Thanks for the recipe! oh my goodness, that looks amazing! i could definitely eat a few bowls of that right now. This looks so delicious!! I love the topping and how you dressed up the jar, its so nice! Your recipe looks delicious. The fact that it’s gluten-free only sweetens the deal. I could really do with a sundae like this soon. It would be nice to give this kind of frozen dessert a shot. The flavor sounds great. This looks so good!! this would be an awesome dessert to serve guests also!! love that you included nuts for this one! I never thought a caramel sundae could be so beautiful! These really look awesome and too cute to eat! There are so many twists on sundaes and this one is perfect.!! Looks delicious!!! this loooksss sooo good . Reminds me of my favorite Cold Stone ice cream. Yum! Thanks for sharing at this week’s Inspiration Spotlight party. See you again soon. Pinned & shared. Well doesn’t this sound amazing?! I love your presentation in the jar for this delicious dessert. Thanks so much for sharing with us at Full Plate Thursday and have a great weekend! Yummo Stacie! You’ve done it again. Your desserts are always amazing! This has my name written all over it. Two of my favourite things, caramel and banana. Thanks so much for linking up to Thriving on Thursdays. I’m featuring this one at tomorrow’s party. Wow, this looks so good! Thanks for sharing at Merry Monday! Oh my word! This just made my mouth water! It looks delicious 😉 Thanks for sharing at #SmallVIctories linkup!